Sometimes you have to abandon the outside activities and head on inside. Those Winter days might just be chilly in sunny California, while, on the other side of the USA, people are huddled inside their respective home, hibernating away for a good 4-6 months every year. When the days get shorter and the sun is non-existent, you have to rely on good lighting in the kitchen, not only for tasks, but to see who you are breaking bread with. Well, maybe that is a bit of an exaggeration, however, the kitchen is sure a happenin’ place. Whether it is dinner with the family, or casual drinks and munchies with friends comfortably gathered around the kitchen table, it seems that no matter how adequate you think the lighting is in the kitchen, there is always room to expand on your current lighting. There are several ways to modernize your kitchen with some of these trending kitchen lighting ideas which are listed below. The kitchen, having earned the honor of being the hubbub of activity in the house, could conceivably have task lighting for every corner of that room, and it still not be light enough. Of course, it is wonderful when the sun is streaming through the window and the curtains are parted permitting those sunbeams to dance on the ceiling and to light up the room. Even a well-built skylight will bring much-needed light directly into the kitchen, provided it does not heat up the room too much during the warmest part of the day. But, eventually you will need to rely on artificial light and there are a wide variety of options for spotlighting certain areas of the kitchen, providing ambient lighting or focusing or training the light on areas needed to complete tasks. Whether socializing, cooking or eating is the main objective of the kitchen, you don’t want to skimp on the light. In years past, there was one light in the kitchen, usually it was a globe-type device which shed a measly amount of light into the room, or perhaps a swag lamp over the kitchen table was your sole source of light. In both cases this primary light source left the rest of the kitchen way too dark. Today, the trend for lighting in the kitchen is layering. Rather than relying on one lighting source, you utilize several types of lighting fixtures or solutions to provide layers of light, thus adequately illuminating the room. This is lighting used for decorative purposes and creates a certain mood in the kitchen with a dimly lit area and a soft glow. Under-cabinet lighting is strictly used for ambient lighting. Those soft lights will highlight such portions of the kitchen as the counters and back splash areas. Under-counter lighting will focus a warm glow onto your counters and has been a trending look for the past few years, especially since natural stone, like granite or onyx, became popular. 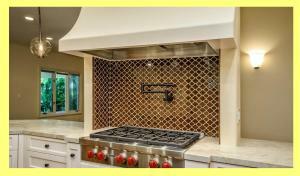 Sconce lighting will provide ambient lighting in your kitchen. Whether you use a pair of sconces or hang one on a wall by itself, it will shed light upward and provide much-needed light wherever you want it. The trending sconce finishes are mostly rustic, with burnished finishes like copper and brass. Halogen lighting when used inside a glass curio cabinet will showcase heirlooms and collectibles. Up lighting is defined as special lights installed on cabinet tops whose sole purpose is to highlight a high ceiling. Foyer lighting is an option for kitchens directly adjacent to the foyer. Using large pendant-style ambient lighting in the foyer area, causes the light to spread into the kitchen area as well. Dimmer switches are an alternative form of lighting which aids in creating ambiance in the room. Soft lighting sometimes is all that is needed, when tasks are not being performed, so dimming the lights is an adequate lighting scenario. This is lighting used to illuminate the room for the sole purpose of adding adequate light for performing tasks. Track lighting for overhead will provide more than adequate lighting in the kitchen and ensure your kitchen is well lit. Track lighting is an excellent example of layering lights in a room as it will fill in the gaps where the other types of ambient or task lighting cannot provide light and results instead in shadowy areas of the kitchen. Track lighting is not only versatile but there are energy-efficient options available as well if you desire. Recessed lighting means lights are positioned within hollow or recessed areas of the ceiling. This type of lighting offers a clean, streamlined look in a room and requires high ceilings. They may be built right into new homes, or may be specially retrofitted into existing ceilings, such as your kitchen. They are beneficial as they increase the amount of light in a room, and open up spaces so the rooms will look and feel bigger. Recessed lighting is trending these days, but putting them into an existing room really requires the assistance of an experienced contractor who specialized in custom kitchen design in Cupertino. Pendant lighting is a great innovation in modern kitchen lighting. Think of pendant lights like a piece of jewelry, hanging down, and you can imagine how these lights would look in your kitchen. Pendant lights may be thin and streamlined and mounted in a row, or you might find a beautiful and ornate pair of them providing pools of light over an island. Depending on the style of pendant lights, they may be considered both ambient and task lighting possibilities. Counter top lighting is used to directly highlight beautiful natural stone counter tops, like a glossy onyx as an example, or may be used to focus light on collectibles which are found in the counter top areas. Although used for these purposes, once again, they are considered ambient lighting, whereas, they might also help to assist the cook in reading the recipe and in food preparation. Since counter top lighting may be used for long periods of time, you might want to opt for the energy-efficient lights. You have a world of options to light up your life. See an experienced custom kitchen designer and discover how to beautify your kitchen and put it in the best light possible.